WorldSBK is… Where rivalries are formed! Head-to-head battles, on-track rivalries, personality clashes and hard racing have shaped WorldSBK history for many years! From the MOTUL FIM Superbike World Championship’s inauguration in 1988, rivalries have often provided an exciting dynamic and an entertaining spectacle for fans. Whether we reminisce about Carl Fogarty and Pierfrancesco Chili, Troy Bayliss and Colin Edwards or Ben Spies and Noriyuki Haga, WorldSBK’s duels have provided thrilling, edge-of-your-seat racing. Looking back through history, some of the motorsport world’s greatest rivalries have come from WorldSBK. Carl Fogarty and Pierfrancesco Chili will always be remembered as one of the greatest, particularly after the Dutch Round in Assen, 1998. Chili effectively lost his championship challenge at the final chicane on the final lap, when Fogarty got ahead on the final approach to the chicane. The Italian was far from over and done with, as a big argument followed, and the fallout began – two of the sport’s biggest personalities had clashed and the drama ahead of the final round at Sportsland Sugo in Japan couldn’t have been higher. A year previous, ‘Foggy’ had his hands full with American rider, John Kocinski, with the two clattering together at the Austrian Round, leaving Fogarty in the gravel and Kocinski in third. Kocinski halted Fogarty’s four-year unbeaten run at the TT Circuit Assen the following round, much to the Brit’s anger. Just four years before, Fogarty was dealing with another fast American, Scott Russell. The 1993 championship witnessed the two giants fight it out across the length of the season, whilst Fogarty took the 1994 title when Russell handed him the crown at Phillip Island. Two years of scintillating battles had won Fogarty a reputation of being one of the fiercest riders in the business, who would battle hard with anyone – or EVERYONE. 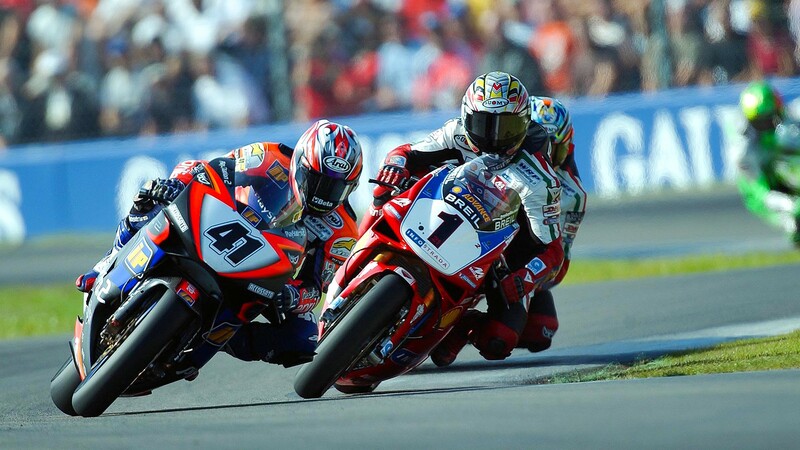 Possibly the greatest rivalry of all time was between Colin Edwards and Troy Bayliss. USA took on Australia, Honda took on Ducati and a veteran took on a young pretender. For two full seasons, the world of motorcycle watched on in awe as the two went head-to-head. Their first major battle came in Race 1 at Monza in 2001, rubbing shoulders down into the Parabolica, with the crowd cheering both on. Bayliss beat Edwards to take his first win of the year in front of a massive Monza audience. And then, there is that incredible Imola Showdown which decided the 2002 championship; the two then left the paddock but with a legacy which is still spoken about today. However, looking to the future, we may just be seeing the start of a great rivalry between Alvaro Bautista (ARUBA.IT Racing – Ducati) and Jonathan Rea (Kawasaki Racing Team WorldSBK). The WorldSBK giants have already enjoyed on-track battles in the opening two races and look set for a phenomenal season-long tussle. Their famous clash in Thailand has set the scene perfectly for the return to Europe, on tracks that will be a challenge for the Spanish Rookie and for his all-new Ducati V4 R. Bautista may have been to the first four circuits on the calendar, but he hasn’t raced at three of the final four circuits in his career; we may see a 2002-style season end. Watch the new WorldSBK rivalries unfold this season with the WorldSBK VideoPass!